I watched this in pieces over the last two evenings and finished of the tail end at lunch today. 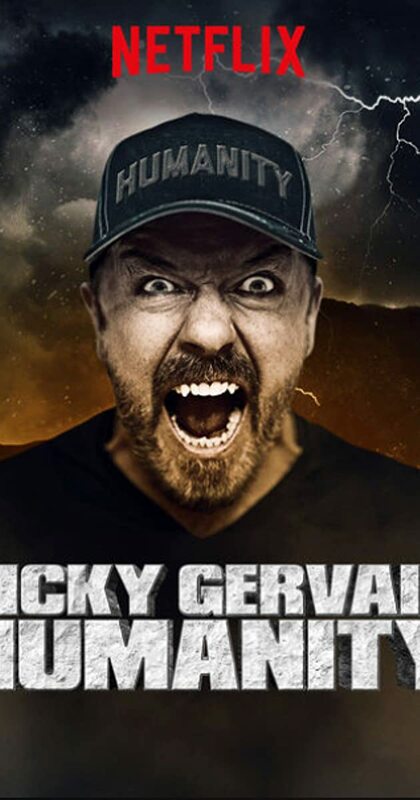 I’ve often thought of Gervais simply as a crass entertainer, but there are so many interesting new dimensions which come out in “Humanity”, they give me newfound respect for who he is and what he’s doing now. This is far more complex than just simple comedy, he’s doing something much more significant with this particular performance. I also haven’t laughed this hard in quite a while. Tears, literally tears. Perhaps most interesting is that he’s got a much wider range of emotions which he’s playing off of here than just the humorous. Gervais has some really interesting philosophy hiding in here among the dark humor. He has an interesting take on comedy and what it does and doesn’t target. The bit at the end on social media was particularly interesting. His take on “The Commons” is quite solid and is something I don’t suspect many could expound upon so eloquently. During the portion in which he talks about his favorite Twitter response ever, he looked down at his phone to quote the tweet. I was reminded of some of the comedy greats I’ve seen at clubs late at night reading out of their beat up notebooks to try out new material. For a moment I thought, “perhaps Gervais is trying out some new material live here.” If it’s the case, then he was genius, though I suspect now that it was just a useful prop to add to the narrative of the joke. Either way, just brilliant. I wonder when we’ll see comics at clubs reading off of phones instead of the old spiral bounds? I wonder if it’ll play an better than the index card or notebook? His closer with the story about his mum’s death and the wonderful prank on the poor vicar put a wonderfully fine point on the entire piece. It is humanity indeed. If there were a god, I’m sure he’d bless Ricky Gervais.